Aloft hotels, often referred to as the ‘Vision of W Hotels’, and part of the Starwood hotels group, have never really interested us – they seem quite modern and loud, and seem to be some of the more budget hotels in the group. When we decided to spend a few days in Bangkok before our flight home to Southampton, we found a lot of the hotels full for the dates we were we were staying, so we decided it give it try, and booked a one night stay. Aloft is in the heart of Bangkok, Soi 11 of the main Sukhumvit Road. It was an easy taxi ride from the airport to the hotel – our driver knew where he was going, and we arrived, only 400bhat poorer, having paid our own tolls and ensured he took us direct. Compared with our extortionately priced taxi rides in Koh Samui, our driver earn his fare and subsequent tip for missing out any unnecessary tours around the capital! The hotel staff were friendly and attentive at check in – and the first thing that I noticed was the very pleasant fragrance in reception. We had booked one of the Aloft Touch Rooms, using the SPG app, which had meant that we should have been able to use our smart phone as a room key, however, it didn’t seem to work for us – this frustrated Darren, but I’m a technophobe, and more than happy with the classic room key configuration! Hungry, we visited the Re:Fuel bar downstairs in the lobby. Although we had a browse through the options, the chance to build your own sandwich ‘Subway style’, with choice of breads, fillings, salads and sandwiches, we were tempted by the hotel menu for a pre made sandwich and fries. We weren’t disappointed. For just under 400bhat each it was an expensive sandwich by Thai standards, but in a 4/5 star hotel it was not unexpected. Drinks cost in the region of 100bhat – I had a sparkling water, Darren a barista special Rose Late. The sandwiches took a while to arrive but were worth the wait – and instead of fries we had nice chunky potato wedges. I have to admit to being disappointed that the toiletries were dispensers stuck to the shower wall and were not individual bottles, and had expected them therefore to be cheap and cheerful. I was wrong. The Bliss Spa shower gel was the best I have ever used! It lathered up so well, and it smelt divine! The shower also had a brilliant pressure, although it took a while to warm up. Sadly, as an avid fan of hotel toiletries, I could not take this home with me, though I would have loved to. Unusual for Thailand, there was no shower cap, cotton buds, comb etc. provided. I had run out of toothpaste, but a quick call to the hotel reception, and we were provided with two toothbrush and paste sets in an instant. After our dinner, we popped into the nightclub situated just outside the hotel, but at 11pm it was almost empty. We were offered a private area in the club for 7000bhat, but laughed and left, as they tried in vain to make us stay! The rest of Bangkok, in and around Soi 11 was surprisingly quite, too. 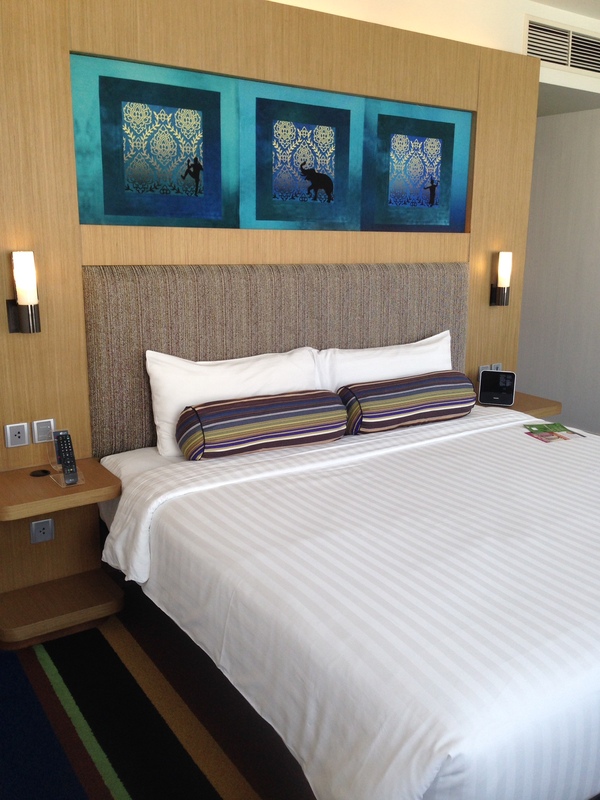 Our sleep at Aloft was the most comfortable of the trip – with a good mattress and luxury sheets. Our bed faced the extra large windows, reaching to the top of 9 foot ceilings, and were so comfy, we both fell asleep, curtains open. We awoke early and refreshed to the sun coming in. On checking out, we asked if a taxi could be called to take us to the Westin Grande Sukhumvit, another Starwood property just up the road. We were offered a complimentary shuttle (Tuk Tuk), however were told that it was on its journey back and we would just need to wait a few minutes. 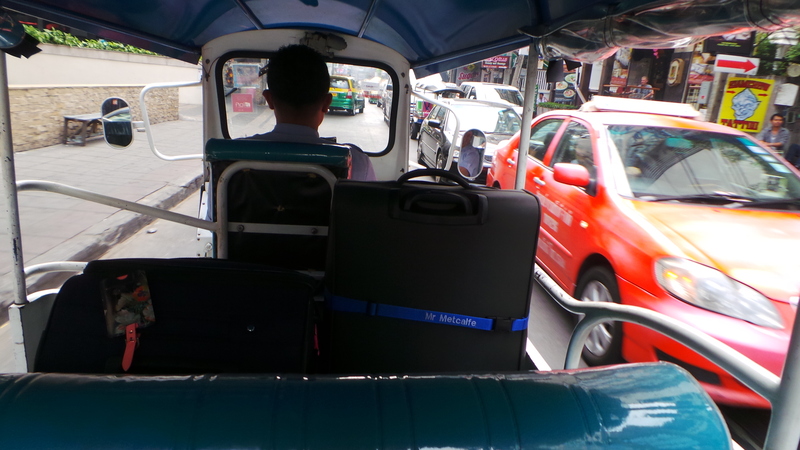 After half hour it became clear that the Tuk Tuk driver was travelling further than the BTS station up the road, and when staff realised that we were still waiting they set off to find out why. Finally, the shuttle driver arrived back, and was ready to take us to the Westin. In true Tuk Tuk driver fashion, we pelted up the road as he fiddled on his phone, never crashing, but never that far away, for the 2 minute journey up the road. And, before we had even stopped and got out of the Tuk Tuk, he had already collected his next fare, for his indirect journey back!